Oh, yes, the awesome might of antimatter! Irresistible to adolescent boys who reflexively have to take things to extremes, automatically turning it up to 11. The last refuge of the "bigger is better" crowd and men who have anxiety issues about their manliness. Starship truck-nuts. Also darling of the Star Trek crowd, who worship anything absent-mindedly slipped in to ST:TOS by The Great Bird of the Galaxy. But once you take a closer look, blasted stuff is almost more trouble than it is worth. Antimatter (sometimes called "Contra-terrene" or "Seetee") is weird stuff that explodes if it comes into contact with ordinary matter. Specifically if atom of antimatter comes into contact with an atom of matter, the mass of both is converted from matter into energy. And by "explode" we mean "makes a nuclear bomb look like a damp firecracker." This process is technically called "annihilation" which is such a vividly evocative term. Any Star Trek fan can tell you it can't be beat when it comes to getting the most bang for your buck. How much bang? Well, in theory if you mix one gram of matter with one gram of antimatter you should get 1.8×1014 joules of energy or about 43 kilotons. Why 1.8×1014 joules? Surely you remember Einstein's famous E = Mc2. c is the speed of light which is 299,792,458 meters per second. Squared it is 89,875,517,900,000,000 or about 9.0×1016. M is mass in kilograms and E is energy in joules. So 0.002 kilograms (2 grams) times 9.0×1016 equals 1.8×1014 joules. QED. Once more, to get some idea of the amount of damage represented by a given amount of Joules, refer to the Boom Table. Technically, it is the matter and antimatter subatomic particles that annhilate each other, not the atoms as such. Antimatter protons are called anti-protons, antimatter electrons are called positrons, and antimatter neutrons are called anti-neutrons. So if an anti-atom of anti-hydrogen (with one positron and one anti-proton) strikes a normal atom of helium-4 (with two electrons, two protons, and two neutrons) the single positron will annihilate one electron and the single anti-proton will annihilate one proton. The remaining electron, proton, and two neutrons will come flying out of the blast. Actually the energy of the explosion will create other particles as well, see below. The antimatter version of a given particle looks like the particle seen in a mirror (that is, some of the properties have equal magnitude but opposite sign). The practical effect is the particle has the opposite charge, a proton has a positive charge while an anti-proton has a negative charge. Neutrons have no charge, neither do anti-neutrons. But anti-neutrons spin in the opposite direction and have other differences. If you read scientific papers about antimatter, they sometimes denote antiparticles by writing a bar over the particle's symobol. So if a proton is p an antiproton is written as p. Just to be annoying, sometimes they denote antiparticles by writing the charge sign. Electrons have a negative charge, positrons have a postive charge. So they are written as e- and e+ respectively. Older scientific papers are even more annoying. Some use the term "negatron" to mean "electron", other use it to mean "anti-proton". Thankfully the term is now pretty much obsolete. The main virtue of antimatter power is that it is incredibly concentrated, which drastically reduces the mass of antimatter fuel required for a given application. And mass is always a problem in spacecraft design, so any way of reducing it is welcome. Every gram counts. 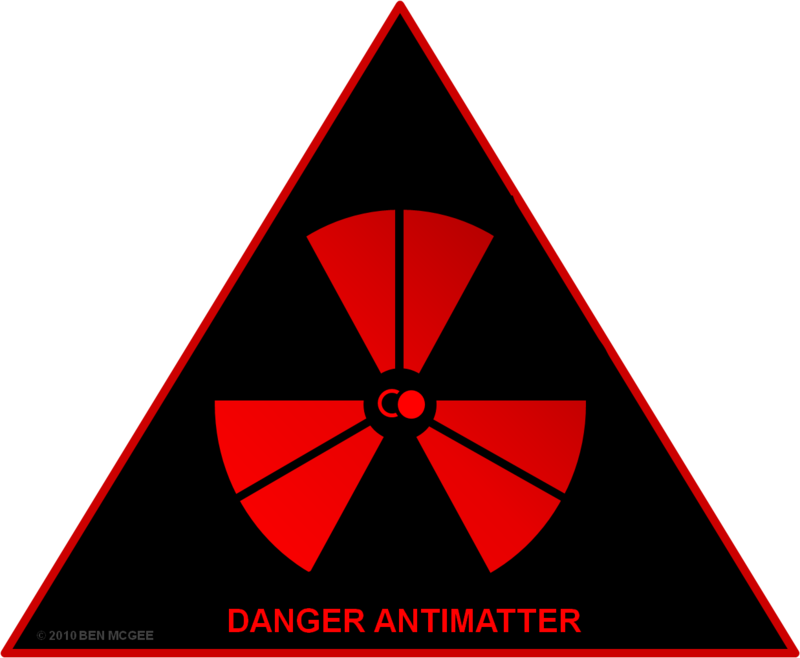 Antimatter hazard sign by Anders Sandberg. Symbol inspired by a Penning trap. Proposed Antimatter Hazard Symbol, modeled after 10 CFR 835 requirements for Radiation labeling and posting. Design by Ben McGee. Free to use but artist asks that you sent him a link or image of the results. And kept macassars on his chairs. That bore three letters: A. E. C.
Out stepped a visitor from Earth. Clasped, and the rest was gamma rays. It isn't? Looks like one to me. Take it from me, I should know. What is not well known is that unless the situation is non-standard, antimatter is not a power source. It is an energy transport mechanism. Let me explain. The same situation with antimatter also exists with respect to the so-called "hydrogen economy". Proponents point out how hydrogen is a "green" fuel, unlike nasty petroleum or gasoline. Burn gasoline and in addition to energy you also produce toxic air pollution. Burn hydrogen and the only additional product is natural ecologically pure water. The problem is that while there exist petroleum wells, there ain't no such thing as a hydrogen well. You can't find hydrogen just lying around somewhere, the stuff is far too reactive. Hydrogen has to be generated by some other process. The generation process consumes energy (such as electrolysing water using electricity generated by a coal-fired power plant). This is why hydrogen is not a fuel, it is an energy transport mechanism. It is basically being used to transport the energy from the coal-fired power plant into the hydrogen burning automobile. Sort of like miles of copper electrical wires converted into a cryogentic tank of fuel. This means that unless there exist "antimatter mines", antimatter is also an energy transport mechanism, not a power source. In Star Trek, I believe they found drifts of antimatter in deep space which made convenient antimatter mines. 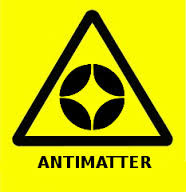 In real life, astronomers haven't seen many matter-antimatter explosions (signature of antimatter mines). Well, they've seen a few 511 keV gamma rays (the signature of electron-positron antimatter annihilation), but they've all been from thousands of light years away and most seem to be associated with large black holes. If they are antimatter mines, they are most inconveniently located. 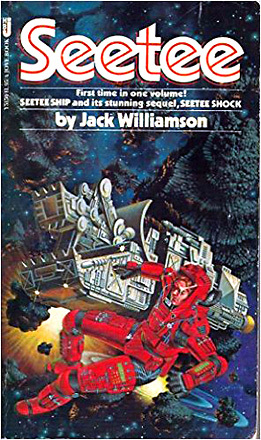 In Jack Williamson's novels Seetee Ship and Seetee Shock there exist commercially useful chunks of antimatter in the asteroid belt. However, if this was actually true, I think astronomers would have noticed all the antimatter explosions detonating in the belt by now. The man known as magic9mushroom drew my attention to the fact that Dr. James Bickford has identified a sort of antimatter mine where antimatter can be collected by magnetic scoops (be sure to read the comment section), but the amounts are exceedingly small. He foresees using tiny amounts of antimatter for applications such as catalyzing sub-critical nuclear reactions, instead of just using raw antimatter for fuel. His report is here. Dr. Bickford noted that high-energy galactic cosmic rays (GCR) create antimatter via "pair production" when they impact the upper atmospheres of planets or the interstellar medium. Planets with strong magnetic fields enhance antimatter production. One would think that Jupiter would be the best at producing antimatter, but alas its field is so strong that it prevents GCR from impacting the Jovian atmosphere at all. As it turns out, the planet with the most intense antimatter belt is Earth, while the planet with the most total antimatter in their belt is Saturn (mostly due to the rings). Saturn receives almost 250 micrograms of antimatter a year from the ring system. Please note that this is a renewable resource. Dr. Bickford calculates that the plasma magnet scoop can collect antimatter about five orders of magnitude more cost effective than generating the stuff with particle accelerators. Keep in mind that the quantities are very small. Around Earth the described system will collect about 25 nanograms per day, and can store up to 110 nanograms. That has about the same energy content as half a fluid ounce of gasoline, which ain't much. However, such tiny amounts of antimatter can catalyze tremendous amounts of energy from sub-critical fissionable fuel, which would give you the power of nuclear fission without requiring an entire wastefully massive nuclear reactor. Alternatively, one can harness the power of nuclear fusion with Antimatter-Catalyzed Micro-Fission/Fusion or Antimatter-Initiated Microfusion. Dr. Bickford describes a mission where an uncrewed probe orbits Earth long enough to gather enough antimatter to travel to Saturn. There it can gather a larger amount of antimatter, and embark on a probe mission to the outer planets. So, no antimatter mines means antimatter is an energy transport mechanism. The next problem is that antimatter is a very inefficient energy transport mechanism. Current particle accelerators have an abysmal 0.000002% efficiency in converting electricity into antimatter (I don't care what you saw in the movie Angels and Demons). The late Dr. Robert Forward says this is because nuclear physicist are not engineers, an engineer might manage to increase the efficiency to something approaching 0.01% (one one-hundredth of one percent, or 0.0001). Which is still pretty lousy. It means for every megawatt of electricity you pump in to the antimatter-maker you would only obtain enough antimatter to create a mere 100 pathetic watts. The other 999,900 watts are wasted. Specifically they become 0.9999 megawatts of waste heat that has to be gotten rid of somehow. This thing is going to be festooned with lots of huge heat radiators. The theoretical maximum efficiency of converting electricity into antimatter is 50% due to the pesky Law of Baryon Number Conservation (which demands that when turning energy into matter, equal amounts of matter and antimatter must be created). I am assuming that Forward's 0.0001 efficiency has the 50% Baryon effect factored in. Postrons have a mass of 9.10938291×10-31 kilograms which is the energy equivalent of 8.18710565×10-14 Joules. Antiprotons have a mass of 1.672621898×10-27 kilograms which is the energy equivalent of 1.50327759×10-10 Joules. You need one of each to make an atom of anti-hydrogen. If I am doing my math correctly, at a Forward-like high efficiency of 0.0001 it will take 1.50327759×10-6 Joules to make 1 antiproton, or 8.988×1017 Joules (899 exaJoules) to make one kilogram of antiprotons. At current dismal standards of 0.00000002 efficiency it will take 0.0075 Joules to make 1 antiproton, or 4.483×1024 Joules (4.48 yottaJoules) to make one kilogram of antiprotons. 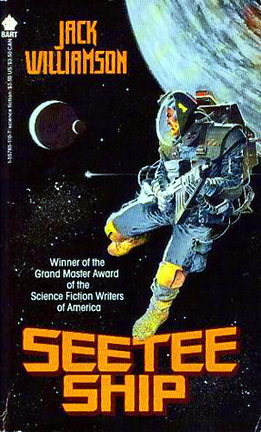 In Charles Pellegrino and George Zebrowski novel The Killing Star they deal with this by having the Earth government plate the entire equatorial surface of the planet Mercury with solar power arrays, generating enough energy to produce a few kilograms of antimatter a year (and enough waste heat to make the entire planet start to vaporize). They do this with von Neumann machines, of course. The novel needed antimatter fuel, because when you are trying to delta V a starship up to 96% c and back down, you are going to need a lotta energy. As a first approximation, imagine Mercury had been replaced by a flat disc of solar cells with the same radius as Mercury (about 2,440,000 meters radius). Area of about 1.87×1013 square meters. Solar flux at Mercury's orbit is about 9,121 W/m2 so we are talking about approximately 170,562,700,000,000,000 watts (0.17 exawatts). So if the entire disc is covered in solar cells, and the cells have a magical efficiency of 100%, and the antimatter factories are Dr. Forward's 0.0001 efficient designs, it could crank out one kilogram of antiprotons every one and one-half hours. If the disk is only 1/3rd covered in solar cells (Equator), and the cells have a NASA standard efficiency of 29%, and the antimatter factories have the current efficiency of 0.00000002, then it could eventuallly spit out one kilogram of antiprotons after 8.6 years of continuous operation. Paul Gilster figures that antimatter fuel would be less expensive than fission fuel if you could get the antimatter cost down to $10 million US per milligram. Unfortunately current linear accelerators can only produce the stuff at $100 billion US per milligram. Keeping in mind that the accelerators are making antimatter as a byproduct, they are not optimized as antimatter factories. Dr. Forward thinks locating antimatter factories in space makes the most sense, because [A] ready access to huge amounts of solar energy and [B] in case of little accidents (so it just vaporizes a space factory instead of wrecking a continent). Forward thinks a solar array one hundred kilometers square could produce ten terawatts of power, enough to run several antimatter factories at full power, thus producing about a gram of antimatter per day. On the subatomic particle level, the antimatter version of a proton is an antiproton. 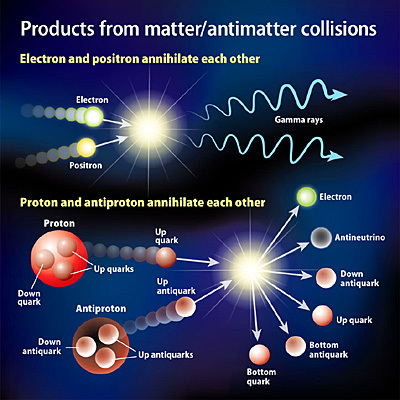 An antimatter electron is called a positron, and an antimatter neutron is an anti-neutron. You might have the mistaken idea that when you mix antimatter and matter that you get energy. That turns out not to be the case. First off, a particle will only annihilate with the corresponding anti-particle. This means if an electron hits an anti-proton, they will just bounce off each other (actually, protons and antineutrons sometime annihilate, and vice versa. But that does not happen very often). Electron-positron annihilations do turn into energy, in the form of gamma rays. But note that electrons and positrons are approximately 1/1836 the mass of protons and other nucleons. So if you are mixing atoms of anti-hydrogen with atoms of hydrogen, the electrons and positrons will contribute about 1/1836th of the resulting energy. Electrons and positrons have a mass of 9.10938291×10-31 kilograms, so an electron-positron annihilation produces about 1.6×10-15 joules. Since protons and anti-protons have 1836 times the mass, they also produce 1836 times the energy. So a proton-antiproton annihilation produces about 2.9376×10-12 joules. The trouble is with proton-antiproton annihilations. This produces (on average) 1.5 neutral pions and three charged pions with an average energy of 250 Mev. And energy that manifests itself in the fact that the particles are moving at very high velocities. Also about 0.005 (0.5%) of the annihilation energy becomes the so-called "prompt" gamma rays. The neutral pions almost instantly (90 attoseconds) decay into "delayed" gamma rays with an average energy of 200 MeV. Which is good if you want gamma rays. If you don't they are an inconvenient blast of deadly radiation traveling in all directions. As is the case with antimatter propulsion. The charged pions (traveling at 0.94c) will move about 21 meters from the reaction before decaying into muons and neutrinos. The fact they are charged means they can be directed by electromagnetic fields for propulsion or their energy harvested by electromagnetic fields to generate electricity. Failing that you can just have them heat up reaction mass to make rocket thrust. The charged particles are annoying if you are trying to make an antimatter bomb. 21 meters from ground zero the charged particles will decay into muons and neutrinos that will do no damage whatsoever to the target. This means about 30% of the energy of the antimatter bomb is wasted. Say you are designing an antimatter engine or power plant and want to know how much deadly gamma radiation you'll have to shield from. You start with the required output energy in watts. For a rocket engine this is the thrust power. For a power plant this is the electrical output. In either case you'll have to muliply the output by the reciprocal of the unit's efficiency, e.g., if the engine is 75% efficient multiply the thrust power by 1/0.75 or 1.33. This is more or less the energy required for the charged pions. To find the total annihilation energy required, multiply the charged particle energy by the reciprocal of its fraction of annihilation energy. By the Reaction Products Table the fraction is 0.664, so you muliply by 1/0.664 or 1.506. Subtract the charged particle energy from the total annihilation energy to find the energy of the deadly gamma radiation. The NRX antimatter engine has a thrust F of 4.4×105 Newtons, an exhaust velocity Ve of 10,790 m/s, and an efficiency of around 80%. The thrust power is Fp = (F * Ve ) / 2 = 2,373,800,000 watts (2.4 gigawatts). At an efficiency of 80% (1/0.8 = 1.25), the charged pion energy is 2,373,800,000 * 1.25 = 2,967,250,000 watts. The only redeeming feature is gamma rays are not neutrons, so at least they don't infect the ship structure with neutron embrittlement and turn the ship radioactive with neutron activation. In the ship's structure the gamma ray flux will be attenuated by the inverse square law. So if the distance from the radiation source is increased by three times, the wattage will be reduced by 1/32 = 1/9 = 0.111. If the gamma ray energy is 1,501,428,500 watts (1.5 gigawatts) it will become 166,658,600 watts (170 megawatts). Yes I know if the annihilation region is a point source the initial distance is zero and the equation blows up. I'm still figuring that out. For a given piece of ship structure at a given distance, figure the attenuated wattage, assume it will be absorbed and turned into heat, and ensure that piece of ship has enough heat radiator support to deal with that much heat. Or the part melts. Figuring this is a bit more complicated. Assume a 1 Curie source of 200 MeV gamma rays at a distance of 1 meter will expose you to a radiation dosage of 1.6×10-4 sieverts per second. Figure the inverse square attenuation by the distance you are from the annihilation region inside engine in meters. In other words: how far from the radioactive engine is the closest part of the habitat module? Reduce the radiation dosage by the attenuation factor. For instance, if the rear of the hab module is 10 meters from the annihilation region in the engine the attenuation factor is 1/102 = 1/100 = 0.01. The dosage becomes 1.6×10-6 sv/sec. This dosage is for a 1 curie source. The antimatter engine cranks out much more than one miserable curie. Divide the engine wattage in watts by 3.2×10-11 (joules in a single 200 MeV gamma ray photon). Divide the result by 3.5×1010 to get how many curies. Then multiply the curies by the dosage to get the actual dosage. Example: engine wattage 1,501,428,500 watts divided by 3.2×10-11 is 4.69×1019 gamma ray photons. Divided by 3.5×1010 is 1.34×109 Curies. Times the dosage at 10 meters 1.6×10-6 becomes 2,100 sv/sec. Which is terrible since 80 sieverts is enough to instantly put you in a coma and kill you within 24 hours, you'll get that dose in about 0.04 seconds. What you do is calculate a biological shadow shield thick enough to reduce the radiation flux to a safe level. 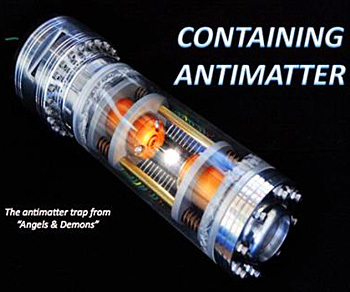 Fictitious antimatter trap from movie Angels & Demons. Fictitious antimatter containment unit floating on anti-grav. 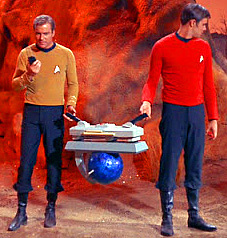 From Star Trek TOS "Obsession"
Unsurprisingly, it is very difficult to safely contain antimatter. When antimatter touches matter you get an earth-shattering kaboom. Unfortunately conventional fuel tanks are made of matter. And if you make the fuel tanks out of antimatter the problem becomes: how do you attach them to the matter structural members of your spacecraft? The strategy is to use electromagnetic or electrostatic energy fields instead of matter walls to hold the blasted stuff. Earnshaw's theorem proves that no set of static charges can be used to create a stable trap. The best you can do is metastable, and the vast majority of configurations are actively unstable. You need to cheat with nonstationary dynamic fields, as in a Penning Trap. You do not want an antimatter canister the size of an oil drum containing barely enough antimatter to power a 10 watt light bulb for half a second. As a general rule it should be at least as power dense as TNT. This boils down to 4.63×1016 positrons per cubic centimeter or 3.6×1013 anti-protons per cubic centimeter. However dense the antimatter is, the containment system needs to be able to store a significant volume of the stuff. It doesn't matter if you can store antimatter at densities approaching dwarf star matter if you can only store a volume too small to be seen with an electron microscope. The more the energy stored, the bigger the boom if something goes wrong. The containment unit need to be idiot-proof since there are so many idiots out there. It should not pose an environmental hazard to anybody who has to be near it. And there are those pesky chemical, environmental, and explosive safety requirements common to energy sources. It would be nice if the unit can be used with multiple applications, i.e., if you can just flip a switch and electricity comes out the power outlet. As opposed to it producing neutrinos or something else difficult to use. And for spacecraft use, it should be able to handle free fall or expected levels of thrust without exploding. It is a plus if the unit does not require large investments of energy for maintenance. Things like cryogenics, high powered lasers, and/or strong electric and magnetic fields make it less desirable. A given system might not have all of these, but the factors are useful for ranking systems in order of desireablity. Penning traps are the current containment system of choice. It uses electrostatic fields to confine clouds of positrons or anti-protons (both of which are charged). The trouble is that like charges repel, so the more anti-protons you try to cram into a Penning trap, the more the cloud wants to expand due to electrostatic repulsion, and the more energy you'll need for the confining electrostatic fields to keep it from rupturing. Which is alarming, since the words "rupturing" and "antimatter" are so often seen with words like "blast radius" and "no survivors." At some point the energy you'll need for the confining field will be more than the energy you'll get from the antimatter, which sort of defeats the purpose of it being a power source. A simplistic estimate is this comes at about 4.4×1012 positrons, which would yield about 0.7 joules. You can avoid the electrostatic repulsion problem by using uncharged antimatter (i.e., anti-hydrogen atoms), but then you cannot use electrostatic fields to contain it. Clouds of anti-hydrogen atoms cannot be contained by magnetic fields, and we don't know how to make artificial gravity fields. Can't use matter containers either, so the question of what to use is rather burning. Magnetic Levitation can be used with solid or liquid antimatter, as long as it is diamagnetic (see details below). This will work with solid or liquid anti-parahydrogen and anti-lithium. Problems include convincing positrons and anti-protons to combine into liquid anti-hydrogen, making the magnetic field tight enough so no anti-atoms escape, making the system stable, making the system safe, and figuring out how the heck to pour or dump liquid/solid antimatter from one container to another. The magnetic fields in the two containers will tend to interfere with each other, creating a magnetic "pipe" between the two containers is incredibly difficult, and moving the antimatter through the pipe without losing a single anti-atom is non-trivial. Dynamic Fields are time varying external electric and magnetic fields that in theory can hold antimatter particles. Positronium is an "exotic atom" consisting of an electron and a positron chasing each others tail. Ordinarily it has an average lifespan of 125 picoseconds (trillionths of a second), but a 1997 report said crossed magnetic and electric fields could be used to stabilize it. Other scientists say the report is full of it, still others say that the positronium will still have a "drift velocity" which will let the positronium self destruct anyway. Stabilized Molecular Bound States are a type of positron-molecule bound states. Under certain circumstances, a molecule of matter can hold a positron for a few whole nanoseconds (billionths of a second) before it blows up. So some scientist speculate that if they wish real hard it might not be impossible that there exists a bound state that will hold a positron for years. Maybe. Hopefully. Matter Storage means using ordinary solid-state matter as sort of a "sponge" to store antimatter. 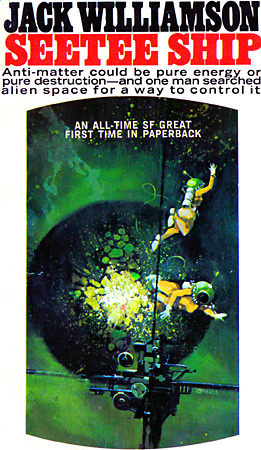 In science fiction this appears in Schlock Mercenary by trapping antihelium atoms inside fullerene molecules. Such a sponge would have to have  stable potential wells that will bind positive or negative charges and  wells deep and wide spaced enough to minimize the quantum overlap between the antimatter particles and the matter particles. Proposed materials include silicate minerals such as zeolite clays, compounds with micro scale pores, nanotubes, and fullerenes. As far as energy density goes, if C60 fullerenes had 1 in ten containing a captured positron, the energy density would be about 2.7×1020 positrons per cubic centimeter, about 6,000 times that of TNT. You would think that this violates Earnshaw's theorem, but quantum mechanics rears its ugly head and fangs the heck ouf of Earnshaw. Actually, if you ignore quantum mechanics, Earnshaw's theorem predicts that hydrogen atoms are impossible, which obviously is not true. I did stumble over a patent for trapping anti-protons in fullerenes. In Michael McCollum's novel Thunder Strike! antimatter is transported in torus-shaped Penning traps, they are used to alter the orbits of asteroids ("torus" is a fancy word for "donut"). Dr. Robert Forward spoke of storing antimatter in the form of a frozen snowball of anti-hydrogen at temperatures below two Kelvin, levitated in a magnetic field to avoid contact with the chamber wall. In a vacuum, of course. The cold temperature is to keep the blasted stuff from sublimating any anti-atoms from the surface and starting an annihilation reaction with the chamber. There will be some infrequent annihilation events caused by stray cosmic rays, but these should not be a problem. 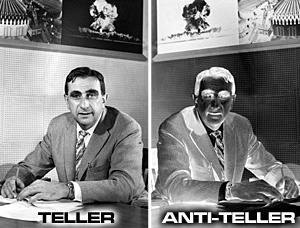 If you are using your ball of antimatter as a fuel source instead of a bomb, Dr. 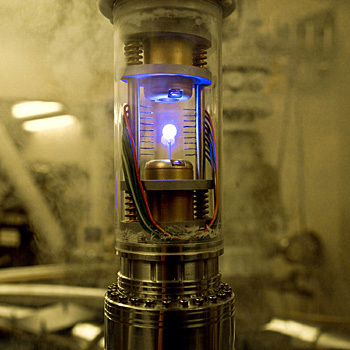 Forward suggests extracting antimatter fuel from the chamber by using ultraviolet lasers. The lasers ionize a bit of anti-hydrogen from the snowball, which is captured by tailored electrostatic fields and piped to the engine. To insure the snowball's mass is not removed asymmetrically (which would destabilize the magnetic levitation), it is spun on its axis while under the laser. Most of the following is from Antiproton Annihilation Propulsion by Robert Forward. The paper focuses on storing antihydrogen by magnetic levitation. An antiproton cloud wants to expand since like charges repel, but if you form antiprotons and positrons into actual antiatoms of antihydrogen it is uncharged. You will want the antiatoms to be cooled down to the point where they form a nice stable ball of ice. Because if it is hotter than ice it will be constantly thermally evaporating a cloud of antiatom vapor which will cause a massive explosion when it hits some matter. Molecular hydrogen is two hydrogen atoms bound together, that's why the chemical symbol is H2. The protons in each nucleus (like most subatomic particles) spin on their axis. If the two spins are in opposite direction you have parahydrogen, otherwise it is orthohydrogen. Plainly the same is true of antimatter molecular hydrogen. Why do we care? Because antimatter parahydrogen is easier to store with magnetic fields. Now pay attention because this is confusing. Focus on whether the part of the word following the prefix "para" is "hydrogen" or "mangetic", it makes a big difference. Parahydrogen is diamagnetic, and orthohydrogen is paramagnetic, due to an unfortunate mismatch of physics terminology. When trying to magnetically levitate something, paramagnetism is wildly unstable, while diamagnetism is relatively stable. When you are dealing with stuff that has 43 tons of TNT worth of blam packed into each milligram, "wildly unstable" is a deal-breaker. Orthohydrogen is paramagnetic so it is attracted to the strongest part of the levitating magnetic field (it is attracted by both poles of a magnet). Parahydrogen is diamagnetic, so it is attracted to the weakest part of the levitating magnetic field (it is repelled by both poles of a magnet). With paramagnetic levitation there is no configuration that can produce stablity. With diamagnetic levitation it is possible to make it stable, as long as the control equipment monitors the situtation and damps out any vibration-like motions (dynamic stability). This is due to Earnshaw's theorem which I am not going to try and explain. One simple design for a magnetic trap suitable for levitating a ball of antimatter parahydrogen ice in a cryogenic vacuum tank is show above. A pair of superconducting rings carrying opposed persistent currents creates a pocket of low magnetism that attracts the ice ball. This is a passive system with no control equipment monitoring the stability. And since the rings are superconductors, any interruptions of electrical power are not an immediate disaster. This is a dynamic electrostatic levitating system (though I was under the impression that one couldn't use electrical levitation on molecular hydrogen). For this system, the ice particles composing the ice ball will need a positive or negative charge. It can be given a positive charge by adding extra positrons when the antihydrogen was created from positrons and anti-protons. Or a negative charge by using an electron gun to annihilate a few positrons. Alternatively ultraviolet light can drive off a few positrons from the ice ball. The levitating plates will require a slight curvature. Earnshaw's theorem raises its ugly head again, proving that it is impossible to create an electrostatic levitation system with static stability (one that is passively stable). It will need a dynamic stability system, where control circuits monitor the position of the ice ball and adjusts the field as needed and/or alters the charge on the ice ball. The major drawback is since you are using electrostatic fields and control circuits, if the electrical power goes out your spacecraft goes up in a blaze of glory. Back in 1982 NASA's Jet Propulsion Laboratory had a similar system that could levitate a 20 milligram sphere of garden variety water ice, under the one gee gravity field of Terra. Since water is 13 times as dense as antihydrogen ice, the JPL system could also levitate a 1.5 milligram sphere of antihydrogen ice of the same size, surface area, and surface charge inside a spacecraft accelerating at 13 gees. I will note that for the NRX solid core antimatter engine 1 milligram is enough antimatter fuel to handle seven metric tons of propellant. 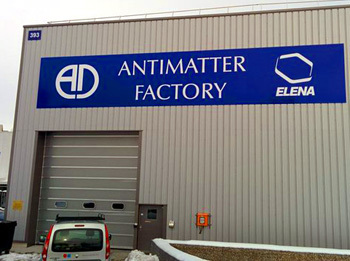 The antimatter factory will produce nice stable ice-cold spheres of antihydrogen vacuum-packed in magnetic fields. By "cold" we mean about one millidegree above absolute zero. The vapor pressure of antihydrogen drops precipitously once the ice ball is cooled below 4 Kelvin, but you should get it down below 2 Kelvin just to be safe. The trick is keeping the spheres cold. If they heat up they will start emitting antimatter vapor and then it is all over except for the mushroom clouds and annihilated spacecraft. Even at fraction above zero Kelvin some antiatoms will evaporate off the ice ball, because Quantum. These few antiatoms will create radiant heat when they strike the metal walls of the containment chamber. By the same token molecules of ordinary matter can be knocked off of the chamber walls, and create heat when they drift over and hit the antimatter ice ball. And then there are those pesky cosmic rays, which are still made of matter and can easily penetrate the chamber and hit the ice ball. The antimatter will have to be cooled with passive cooling, since active cooling won't work when the coolant is matter and the item to be cooled is antimatter. As all objects a slightly warm ball of antimatter ice will emit vapor. While the vapor is a problem, at least the emission of the vapor will cool off the ice ball. This is one form of passive cooling, which is why sweating on a hot day will cool you off. In the diagram above, for purposes of analysis, the antimatter ice ball in the center has a mass of one microgram, a density of 0.08 gm/cc, a radius of 0.15 cm, and a surface area of 0.28 cm2. For lack of better data the emissivity of long infrared from the ice is assumed to be 0.5. The surrounding vacuum chamber has a radius of 2 cm and the walls are painted a nice absorbent black. This is cooling by emission of thermal radiation, a second form of passive cooling. For maximum cooling the laws of thermodynamics decree that the ice ball should be as warm as is allowable, and the chamber walls as cool as possible. The report assumes the ice is at 2 Kelvin. At this temperature the vapor pressure will be 4×10-18 Torr or 0.1 atom/cc. The chamber walls are assumed to be at 1 Kelvin, cooled with magnetic dilution, paramagnetic refrigeration, or something. Doing the math the ice ball will emit antihydrogen vapor from its entire 0.28 cm2 surface area for a total of 950 antihydrogen molecules per second. With a 2 K ice ball with a surface area of 0.28cm2 and emissivity of 0.5 in a 1 K chamber the cooling power is 11×10-12 watts or 11 picowatts. The ice ball will have a cooling rate of 1×10-6 Kelvin/sec or about 0.1 K/day. The evaporation of antihydrogen molecules will drop below 950 molecules per second, so the main source of heat will be reduced. However, the cooling power depends upon the difference in temperature between the ice ball and the chamber walls. The cooling power however would only drop off as the fourth power of temperature. End result is the temperature of the ice ball would stabilize somewhere below 2 Kelvin and above the 1 Kelvin temperature of the chamber walls. Cooling via emission of radiation is assuming the emissivity of long infrared from antihydrogen is 0.5. If the emissivity turns out to be lower than that cooling by emission ain't gonna work. Other methods will have to be used. Storage cavity will be bigger. Laser beams will be used to cool off evaporated antihydrogen molecules and herd them back onto the ice ball. the iceball would be kept highly electrostatically charged. The vibrational excitation of the normal modes of the antihydrogen iceball by the internal heat would cause vibrational motion of the excess positrons on the surface of the iceball. These vibrating charges would cause changes in the image charges in the suspension electrodes. The changing currents in the electrode control circuits would then be damped out with a cryogenically cooled resistor. No, I do not understand any of what I just wrote. This appears to be the same technique as electrodynamic cooling, only using magnetic fields instead of electrostatic fields. The iceball is kept in a strong magnetic field. 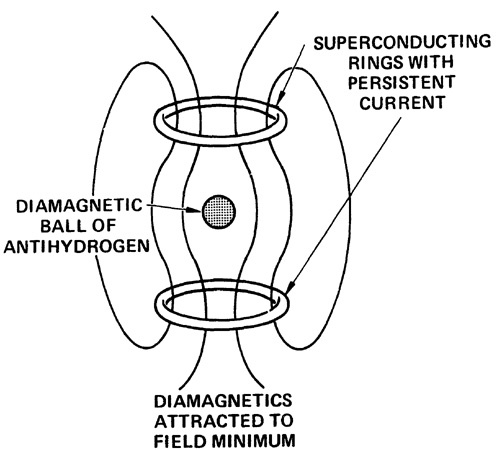 The diamagnetic antihydrogen would couple to the magnetic field lines. Heat vibrations in the antihydrogen would cause fluctuation in the magnetic field, which would cause fluctuations in the electrical current running through the electromagnet. By using a passive cryogenically cold resistor or a clever active "cold damping" circuit the current and thus the magnetic field would be given opposing fluxuations which would stop the heat vibrations in the coupled antihydrogen. No, I do not understand any of that either. Each annihilation will produce 0.511 MeV gamma rays from positron-electron annhilation, 250 MeV charged pions from the proton-antiproton annhilation, and 200 MeV gamma rays from decaying neutral pions. This is the annihilation heat that must be controlled. The miniscule 0.511 MeV gammas from the positrons are chump change and can be ignored. The 200 MeV gamma rays are gammas, which are noted for being incredibly penetrating. They have an attenuation coefficient of 0.1 cm2/g. Since the antihydrogen ice has an incredibly low density of 0.0763 gm/cm3 the attenuation per unit path length is a low low 0.0076/cm. Translation: most of the gamma rays are going to pass right through the ice ball without heating it up any. Heck, they are going to pass right through the containment chamber walls as well. Bottom line: a 200 MeV gamma ray is only going to give the ice ball about 460 keV or 7.4×10-14 Joules. The charged pions are pretty penetrating as well. Figure each charged pion will give the ice ball 340 keV or 5.5×10-14 Joules. Assuming each proton-antiproton annhilation produces 3.0 charged pions and 1.5 neutral pions that decay into gamma rays, the annihilation of an antihydrogen molecule will produce 6.0 charged pions with 250 MeV each and 6.0 gamma rays with 200 MeV each. And 4.0 positron-electron gamma rays of 0.511 MeV each that we will ignore. Note the implication of the high penetrating power of the charged pions and gamma rays. If the antimatter levitation system fails and the antihydrogen ice ball falls to the chamber floor with a clank, this will not result in a huge explosion. Most of the released annihilation energy will go sailing through the containment chamber walls without heating it up. The energy will mostly be absorbed by the bulk of the spacecraft. So instead of a violent explosion it will be more like a meltdown of the ship. But the report says more study is needed. I suspect you will get a violent explosion if the the amount of antimatter was a bit bigger than a 3 millimeter BB-shot-sized ball of antimatter ice. The 950 antihydrogen molecules per second emitted by the ice ball will annihilate themselves on the chamber walls (point marked PW on diagram above). The annihilation products will be emitted in all directions. Since the chamber is 2 cm in radius and the ice ball is 0.15 cm in radius the ball will intercept πr2/4πR2 = 1.41×10-3 of the particles. At a rate of 950 antihydrogen molecules per second this comes to a heating power of 1.2×10-12 or 1.2 picowatts. Since the cooling power of the ice ball is 11 picowatts, a heat influx of only 1.2 pW is not going to do diddly-squat. Normal matter molecules knocked off the chamber walls will hit the antimatter ice ball (point marked PS on diagram above). Since the chamber has been cooled to a cryogenic 1 Kelvin, it is not going to emit any normal matter atoms by thermal processes. Not a significant amount at any rate. But some molecules might be emitted by non-thermal processes such natural radioactivity or cosmic rays. Bottom line is up to 10 annhilations per second can happen on the surface of the ice ball before the cooling power is exceeded. Report goes on to say that more research is required to figure out how many normal atoms will be shed by a containment chamber. Here an antihydrogen ice ball many milligrams in size is electrostatically suspended in vacuum. The problem is how to get a few antiatoms out of the ball and into the reaction chamber without the antiatoms touching any matter in between and blowing up the engine. 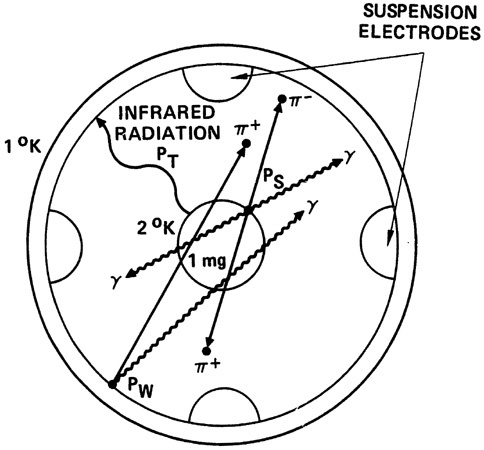 In the diagram above, the ice ball is irradiated with ultraviolet light. 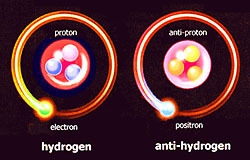 Antiatoms of hydrogen are split by the UV into positrons and antiprotons. The positrons are thrown to the rear where they annihilate a few stray electrons here and there but creating very little energy (1/1836 of the annihilation energy created by an antiproton). The potent antiprotons fly off the ice ball by field emission where they are caught by a high intensity electric field and directed into the reaction chamber. Alternatively, it might be more efficient to store the antihydrogen not as a solid ball of ice, but rather as a cloud of ice crystals. Each crystal will contain the energy equivalent of 20 kilograms of chemical fuel. Making some unsafe assumptions and frantically slipping my slide rule I figure each crystal should have a mass of about 2.6×10-11 kilograms or 26 nanograms or about 1/25 the mass of a grain of sand. But you'd be better off doing your own calculation. Using a pin-point ultraviolet beam one could drive positrons off a microcrystal, and use electrostatic fields to send the entire microcrystal into the reaction chamber instead of a miserable trickle of individual antiprotons. 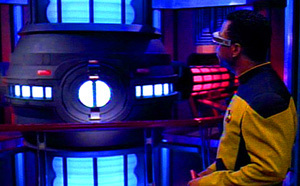 Since the microcrystal is large enough to be detected by sensors, mechanical shutters in the tube can allow passage of the microcrystal without letting any stray atoms from the reaction chamber violate the storage chamber vacuum and causing a cascade failure of the antimatter containment (atoms cause microexplosions violent enough to blow antimatter crystals into the electrostatic plates, causing the plates to annihilate, removing the suspending electrostatic field, allowing the remaining antimatter crystals to hit the ship and convert it into hot ions or at least blow its heinie off ). ...Since antimatter and matter annihilate each other on contact, releasing enormous bursts of energy from literally microscopic amounts of propellant, you cannot simply fill a shuttle tank with liquid anti-hydrogen and let it slosh around inside. The only storage method that has a hope of working is solid anti-hydrogen, supercooled within one degree of absolute zero (within one Kelvin of -273 degrees C). At this temperature, anti-hydrogen condenses into "white flake," with an extremely low evaporation rate. Particles of solid anti-hydrogen will be suspended and held away from the "pod" walls, probably by electrostatic forces and/or magnetism. According to our latest models, near 0.0005° K, anti-hydrogen should be sufficiently stable as to allow, in the form of matter-antimatter micropellets or wafers (we are presently working to determine which design, layered pellets or wafers, will provide optimal thrust). With one-fifty thousandth of a degree Kelvin, matter-antimatter storage becomes thinkable because wave functions do not overlap enough to produce an appreciable reaction, at least in principle. 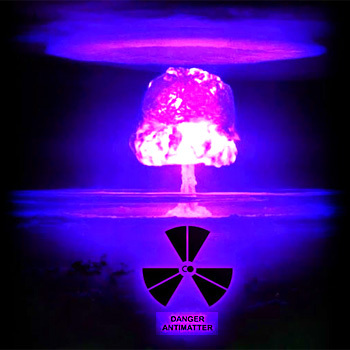 In order to study antimatter it has to be kept separate from matter, to prevent it from annihilating. Electrically-charged antimatter can be trapped in a device called a Penning trap. The Penning trap requires an ultrahigh vacuum. Inside the trap, magnetic fields force the charged antiparticles to spiral around the magnetic field lines, and electric fields confine them along the magnetic axis. In June 2011 the ALPHA experiment at CERN reported that it had succeeded in trapping antimatter atoms for over 16 minutes: long enough to begin to study their properties in detail. The world record for storing antiparticles is held by the TRAP experiment at CERN: it kept a single antiproton in a Penning trap for 57 days! The scientists performed very precise measurements of its mass and charge before the trap was switched off and the antiproton ... annihilated. 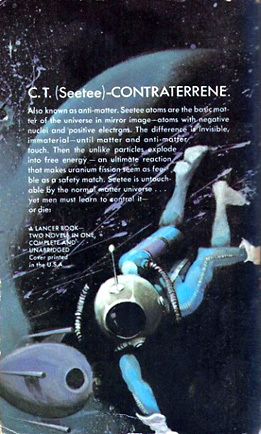 (ed note: Contra-terrene is an ancient term for antimatter. Contra-terrene = C.T. = Seetee. 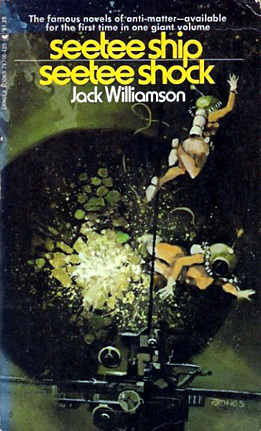 Jack Williamson invented the term. 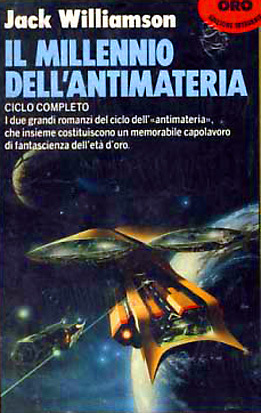 In the novel there are chunks of antimatter floating freely in the asteroid belt, fragments from some antimatter planet. They are just like chunks of any terrestrial planet, composed of random concentrations of various elements. That is, they are not elementally pure. Everybody in the novel who wants to utilize seetee is trying to make a "bedplate", that is, some sort of antimatter containment gizmo to allow antimatter artifacts to be forged without them coming into contact with anything composed of matter. Permanent magnets can levitate seetee chunks that have a high proportion of anti-iron, but the impurities make this dangerously unstable. "They're energy." Rick straightened in the seat. "And energy, if you stop to think about it, is pretty necessary. Our lifeblood, really. Out here fission energy drives our ships and our terraforming installations. It's all that makes life possible on these rocks. But the fissionable matter is just about used up." She stared at him. "You aren't talking about—seetee power?" He nodded soberly. "It has to come—soon. We've no coal or oil on Mars or the Jovian moon's or any of these rocks. If we're going to stay, after the uranium and thorium are gone, we'll have to use seetee." "But how?" She glanced at the black sky uneasily. "If it always explodes like that when you touch it—"
"We can't touch it." He sat silent for a moment, frowning at her thoughtfully. "That's the whole problem—to work the stuff without contact. We've got to find some way to join seetee and terrene matter, and yet keep them from reacting. To put terrene handles on seetee tools, and support seetee machines on terrene foundations." "That calls for a bold man, Mr. Drake." She turned quickly in the seat to study him, as if she hadn't really seen him before. "Would you try it, yourself?" "An academic question." He saw now that he had talked too much, but he tried to smile disarmingly. "You'd need a lot of money and a license from the Mandate, neither of which I have." "I'd try," he told her soberly. "Because I think we've come to a turning point. We must make seetee bedplates, and build the power plants for a new world on them. Or else just wait for this old world to blow up under us—when the tensions of the struggle for what is left of the old power metals reach the breaking point of the Mandate." "Fought probably with seetee bombs." "Bombs?" Her red head shook protestingly. "But can you make seetee bombs without this bedplate?" "Somebody can and will." He nodded bleakly. "To generate useful seetee power, you'd need a whole chain of seetee machines to mine ore and work metal and build more seetee machines—all untouchable. 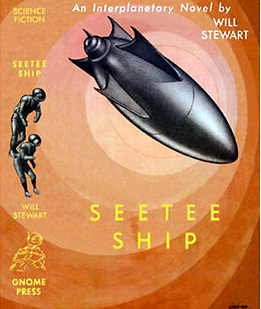 But any lump of seetee will function as a bomb, if you can just deliver it on anything terrene—and I'd bet that every major planet has engineers at work right now on methods of delivery." "I did hear war talk, even back on Earth.' She nodded reluctantly. "And I can see that Uncle Austin's worried about the situation here. But how do you think seetee power could help?" "Energy means life," he said. "We're about to fight for the few last deposits of uranium and thorium, just because they aren't rich enough to keep us ail alive. But a lump of seetee the size of your fist will yield more energy than a ton of uranium or a million tons of coal. And there are whole planetoids of seetee. More than enough to go around, if we can just develop it." He went to work that day. 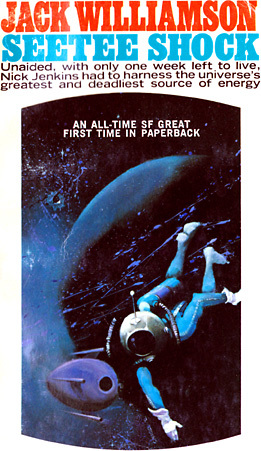 Vickers gave him the keys to a huge, cold, blue-glass-and-bright-nickel office in the Interplanet building. He spent most of the next year shut up there, sifting facts about the drift from rusty mountains of publications in several languages, exploring a thousand unsound schemes for manipulating seetee with magnetic or paragravitic fields, drawing up new plans of his own that Anders always demolished. "Most of our gadgets look pretty good on paper," the tall Earthman admitted once, "But pretty good won't do, not when you're playing with seetee." He stood frowning at the blueprints that Rick had toiled over for weeks. "I can see that your slab of seetee iron ought to float on that paragravity field—but the known paragravitic effects are all temporary. What happens when a coil burns out?" "I've provided for three separate circuits," Rick answered. "Any one should hold it safely." "Till some unlucky mechanic drops a terrene screwdriver on something seetee." Anders grinned cheerfully. "Then your whole installation would go off in a blast hot enough to scorch the planets." "Men won't be working on the seetee section with terrene screwdrivers," Rick protested. "Everything seetee will have to be remote-controlled or entirely automatic." "And there's where you have to hoist yourself by your own bootstraps," the Earthman said. "Automatic seetee machines might build more automatic seetee machines, once you had them going. But how do you expect to get the first one?" "...Bootstraps." 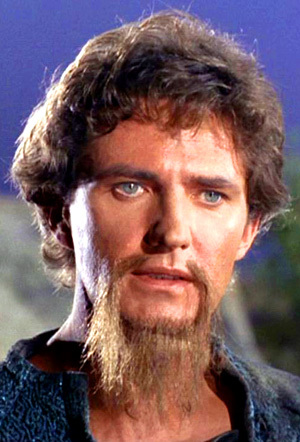 Once more the earthman shook his head. "P'raps we could build seetee machinery to manufacture seetee magnets—if we had settee magnets to build it on. But we don't. 'Fraid you'll have to think of something better." He found his father slumped in a chair too small for him, with both hands bandaged. A gaunt, worn, humble man, in a shabby gray coat and rough miners' boots. His father glanced calmly down at the bandages. "And you can't help this sort of thing, when you're playing with seetee. We were floating a block of seetee iron on a paragravitic field. Must have knocked off a grain of dust so small I never saw it." "If you do have any sort of workable design, he wants Vickers to buy it for Interplanet." "We don't." Sadly, the old man shook his lead. "Sorry, but we don't." "But didn't you say you were floating a slab of seetee iron on a magnetic field?" "We've done that." Jim Drake shrugged heavily. "But that's no bedplate. The fact is, I've given up building any sort of stable bedplate." "Then what are you making?" Rick saw the watchful look in Rob McGee's squinted eyes, and felt his own face turn crimson. "Or maybe you shouldn't tell me that," he blurted abruptly. "After all, I'm still on the Interplanet payroll." "That's all right, Rick," his father said again. "I'll tell you what we're doing. I don't mind you telling Hood— if you think he might back us. We're trying to build a pilot model for a seetee reactor." "But what will it stand on, if you can't build a bedplate?" "We're trying to dodge the problem of contact," Jim Drake explained patiently. "The same way we did when we moved that seetee asteroid off its orbit by tossing a terrene pebble into it." Rick bent intently toward him. "Can you do it?" "Not yet." He shook his head. "But we have floated this block of seetee iron on a variable field, and we looped pick-up coils around it. My idea was to jet a metered stream of some terrene gas against the seetee block, to give us a controlled reaction." "Not the way it should. I don't quite know why. The reaction is never uniform, no matter how we adjust the jet, or what terrene gas we use. The geigers allways show a dangerous radiation leakage through the exchanger field. Dust particles blow off, like the one that hit me. And the seetee block always gets to oscillating, so that we have to stop the jet in a hurry." Rick frowned thoughtfully. "Your seetee block isn't pure iron," he said at last. "I think that's what the trouble is. The seetee impurities would always react in explosive bursts too intense for any exchanger field to pick up, I think." "You're probably right," his father said. "But how can we get a block of pure seetee iron?" "I don't know." Rick shook his head. "Not without a seetee bedplate to build an automatic furnace on." "But your control board will have to be terrene." Anders tried to see the old man's worn face, inside the helmet. "How'd you mean to bridge the gap?" "Induction," Drake answered patiently. "That requires no contact of conductors. We've designed push buttons and verniers to act through induction relays. And there's the terrene half of our main transformer." He pointed at a tall, unfinished bulk of laminated iron and insulating plastic and condulloy conductors, near the row of empty pits. "Induced current in the seetee half was to operate the shop with power from our aid uranium plant—until we could get some sort of seetee reactor going." "Why not show him the hammer?" the girl whispered harshly. 'If he thinks we're forging bedplates!" ...Halfway around the rock, in another shallow iron depression, they found the contraterrene hammer. Anders had expected something small and crude, but the massive red-painted frame beneath the metal shed was three times his height. All the terrene parts were cleanly designed and accurately machined, but the hammer and the suspended anvil were rough native masses of meteoric iron. Red fluorescent paint glowed on the guard rail around them, and small signs warned: DANGER—SEETEE! The Earthman shrank quickly back from the railing, staring at those unfinished natural ingots with a sick fascination. Although he had spent years on the theoretical problems of working seetee, he had never been so near the actual stuff of the Invader. He shivered in spite of himself. "It looks like iron," he whispered stupidly. "Just like terrene iron!" "So long as you don't touch it," Ann reminded him gently. "The hammer itself and the anvil are splinters we shattered off that seetee rock." The old engineer moved calmly to that glowing rail, explaining patiently. "McGee located them, in this new drift around Freedonia, and we towed them into place with magnets wired to the batteries of our suits." Anders stared uncomfortably across Drake's shoulder at the long uneven hammer and the more massive block of the anvil. He knew what would happen if anything terrene touched them, and he felt numbed by the mere notion of towing them with magnets. "The anvil weighs fifteen tons," old Drake's tired, rusty voice went on. "It is floated between negative paragravity fields, that repell it from six directions. The coils draw power from our uranium reactor in the other building." He pointed at an armored cable. "The hammer was to slide in similar repulsion fields." His steel-clad arm indicated the vertical ingot. "There's a reversible paragravity unit at the top of the frame, that was to lift it and drop it." His blank face plate turned slowly to the Earthman. "That's it, captain. Could you forge a bedplate with it?" Anders didn't think so, but he merely asked: "How do you hold the work?" "We don't," Drake said. "I once hoped to design seetee tongs with terrene handles, but my attempts at that were even less successful than the hammer." "What's wrong with the hammer?" "Do you want to see it run?" Anders was conscious of a quietly ominous difference in the old man's rusty voice, and he drew back quickly toward the girl. A pretended accident would be very easy here, and he knew that any human life was worthless against the prize of tamed seetee. "'Fraid?" Ann's low voice was mocking now. "Then I'll hold your hand." He felt her glove touch his. "All right," he muttered huskily. "Let's see it run." Awkward in his armor, the old engineer moved behind a massive parapet of lead and iron that would be useless as tissue paper if anything went wrong. He bent over a simple switchboard, watching a mirror above it. Anders wanted to move back, but the girl stood bold and angry against the glowing rail. The jagged-edged bar of the hammer lifted very slowly. It hung still, while Anders felt a sudden sick desire to stop the demonstration. It came back down to the angular mass of the anvil at last, with a soundless impact. The girl touched his elbow as it struck, pointing calmly. He looked—and terror caught his throat. For that great dark splinter of contraterrene iron had begun to wobble as it recoiled from the blow, as if too loosely held in its guides. The anvil tossed like a cork on uneasy water, rocking toward the field coils that held it. "See how it works?" Ann was asking softly. "Could you forge anything—"
That was all he heard, because he thought that huge seetee block would touch the terrene frame. He snatched the hanger strap of Ann's armor, and flung her backward toward the doorway. His whole body tensed for the blowup he would have no time to feel or see. "Please, captain!" Ann flung herself free of him, with a scornful little toss of her helmeted head. "Now you see we've no bedplate." "—I thought—" He tried to get his breath. "That seetee splinter almost touched the frame!" "If it ever did, the reaction would vaporize Freedonia," she said quietly. "You're safe as anywhere, there against the rail." "Sorry," he whispered shakenly. "S'pose you're right." When he turned to look, Drake had stopped the hammer. The uneven bar and the massive block were quivering in the fields of repulsion that held them, still intact, coming slowly back to rest. ..."How about your seetee reactor?" Anders straightened in his armor, more confident since that fearful hammer had ceased to move. "The one that hurt your hands?" "There's nothing much to tell about it." Drake shrugged in his armor, and his old voice seemed dull with hopelessness. "When I saw this hammer would never work, I tried to rebuild it into a reactor. A tiny orifice arranged to meter a fine jet of terrene gas against that anvil. An exchanger field, with pick-up cables. But as you know, it didn't work. The reaction was as dangerously unsteady as that hammer—my son says because of unavoidable impurities in the native seetee iron." "Seetee looks just like terrene matter," she reminded him gravely. "When you're going about that ship, how are you going to tell what you can touch and what you can't?" "But you can't shoot at everything you're about to touch. You'd be blowing yourself to atoms. Touching off the whole ship, probably." He peered into her eager eyes. "Can you identify seetee without contact?" "Only Cap'n Rob can do that," she said. "But I do know how to make safe short-range tests. With special bullets. I have equipment in my armor. One thing Mr. Drake did invent on Freedonia." "Alpha particles. From a speck of radium. They react with seetee, just like larger bullets. Mr. Drake designed a special geiger, set to detect the gamma rays from those small explosions." As they dropped toward it, the thin black line between the bright half and the dull half of it became an open space of more than half a meter. ...Anders nodded his half-sardonic thanks, and they alighted on the unpolished flange. It was like an iron roadway, fifteen meters wide, curving around a metal planetoid. Anders shuffled cautiously across it, to that dividing gap. "Those disks!" Ann was ahead of him, and a sudden taut elation of discovery trembled in her voice. "Aren't they the bedplates?" Leaning eagerly, balancing the ship's gravitation with the thrust of his drive pack, he saw that the gap between the unlike flanges was spaced with thousands of thick disks. Wide mushrooms of shining seetee steel—but all of them stemmed, somehow, with thick rods of dark terrene iron! The crowning disks were fastened to the seetee flange. The roughly welded terrene stems held the unfinished terrene flange in place. "They are bedplates!" Anders gasped. "Real bedplates!" ..."Odd!" he whispered. "There's something more than gravity, holding us here. Dead as it seems, this thing still has a paragravity field of its own, like a terraformed rock. I wonder if the builders of it hadn't got around the field-loss problem, that we've been fighting ever since Maxim-Gore first found that the forces in sun spots aren't all magnetic." His startled voice dried up, when he saw the bedplates beneath the footway. Thick silver disks, like geometric mushrooms on long crooked stalks. The terrene stalks were welded to the wall, but he saw now that the foot­way didn't touch it anywhere. The railing didn't, either. And something else was odd about that railing. It seemed to be on the wrong side of the ramp, until he saw that it was there to guard the things that walked it from the deadly terrene wall. His head felt light when he first stood up, but he climbed the ladder. Ann set a chair for him, at the little ink-stained desk built against the bulkhead, and opened a drawer in search of paper. Something darted out. "Oh!" She snatched at the object, but it escaped her. "Rick's disk—"
She checked herself, with a flush of confusion, but Anders pursued that fugitive object. It was a circular plate of brightly polished steel as wide as the palm of his hand, with a small hole in the center. It fled from him like something alive, but it was on a leash—a strong cord looped through the hole and tied to a ringbolt in the bulkhead. He caught the cord and drew the lively disk back toward him, but still it darted skittishly away from his fingers. He towed it back toward the desk, but it shied away from the drawer where it had been confined. He noticed that even the restraining cord stood out from it in a wide loop, not touching the bright metal anywhere. He maneuvered it back into the drawer, trapped it in a corner, tried to pin it down. A yielding resistance opposed his hands. He couldn't quite touch it, not even when he pushed down with all his strength. Nor did the disk ever come quite against the bottom of the drawer. "Please put it back!" Ann was pink and breathless with embarrassment. "I didn't mean to show it to you." He closed the drawer on it and turned to stare at her. "Untouchable!" he muttered hoarsely. "Where did Rick get hold of that?" "Oh. Paul!" Agitation shook her voice. "I'm such a fool! Rick didn't want you to know. I can't tell you anything about it." "Then let me guess." He grinned slowly at her discomfiture. "My guess is paragravity. Permanent negative paragravity! Right, gorgeous?" Her lips tightened defiantly, but her face turned pink again. "Right!" His awed eyes fell back to the drawer that imprisoned that elusive disk. "Something we've been looking for, ever since old Maxim-Gore found paragravity in the sunspots. He wrote the equations for a permanent negative field, but we could never make an alloy to hold it." He swung abruptly back to Ann. ..."A surface effect, I could see. Obeys the inverse-square law. Half the distance, four times the repulsion. Means contact just can't happen—even if that disk were pressed close to a seetee surface! Guess these bedplates must be layer-cake affairs. Plates like this locked to the terrene stem, interlocked with seetee counter-plates fastened to the seetee crown? Converting the energy from antimatter fuel annihilation into electricity is also not very easy. The electrons and positrons mutually annihilate into gamma rays. However, since an electron has 1/1836 the mass of a proton, and since matter usually contains about 2.5 protons or other nucleons for each electron, the energy contribution from electron-positron annihilation is negligible. You could use pure positrons, if you are willing to put up with the fact that you'll need 1836 times as many of the little suckers as compared to anti-protons, for the same energy released. You'll need more fullerenes. Attempting to efficiently convert gamma rays into electricity is left as an exercise for the reader. For every proton-antiproton annihilations, 1.5 neutral pions are produced and three charged pions are produced (that is, 33.1% neutral pions and 66.4% charged pions). The neutral pions almost immediately decay into gamma rays. The charged pions (with about 94% the speed of light) will travel 21 meters before decaying into muons. The muons will then travel an additional two kilometers before decaying into electrons and positrons. This means your power converter needs a component that will transform gamma rays into electricity, and a second component that has to attempt to extract the kinetic energy out of the charged pions and convert that into electricity. The bottom line is that there is no way you are going to get 100% of the annihilation energy converted into electricity. Exactly what percentage is likely achievable is a question above my pay grade. Converting the charged pions into electricity is easy, the gamma rays are difficult. There are quite a few schemes that attempt to harness antimatter for spacecraft propulsion. This is the antimatter version of a solid core nuclear rocket. Inside the core, a tungsten target is sprayed with antiprotons (about 13 micrograms per second). The gamma rays and pions are captured by the target, heating it. The hydrogen propellant is sprayed through the tungsten, which heats the propellant. The propellant then jets out the exhaust bell in the usual way. As with solid core nuclear, the maximum temperature is the point where the tungsten core melts. This limits the specific impulse. Microscopic amounts of antimatter are injected into large amounts of water or hydrogen propellant. The energy release turns the propellant into high temperature gas just short of plasma, which shoots out the exhaust bell. The idea is to calibrate the amount of antimatter injected so that the material turned into near-plasma includes most of the propellant but does not quite reach far enough to turn the walls of the rocket into plasma as well. This is not as efficient as a solid core, but it has a higher specific impulse (since there is no tungsten core to limit the maximum temperature). 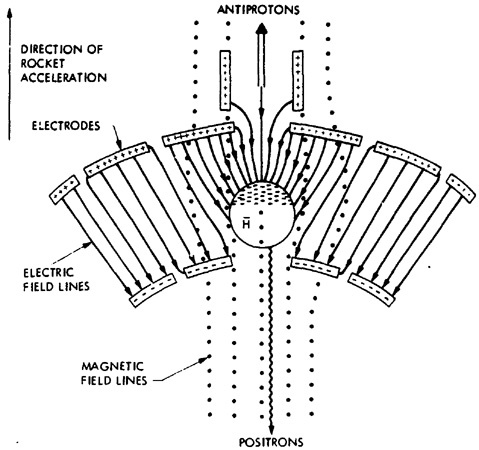 Magnetic fields are used to constrain the charged pions in the chamber so they do work heating the propellant. Similar to Gas Core Antimatter, but more antimatter is used so the propellant actually does become plasma. The reaction chamber has to be a magnetic bottle since there is no way to prevent a solid walled reaction chamber from exploding. The drawback is that a magnetic bottle drastically reduces the propellant mass flow, which drastically reduces the amount of thrust. The advantage is the specific impulse is much higher. Equal amounts of matter and antimatter are used, but no propellant. 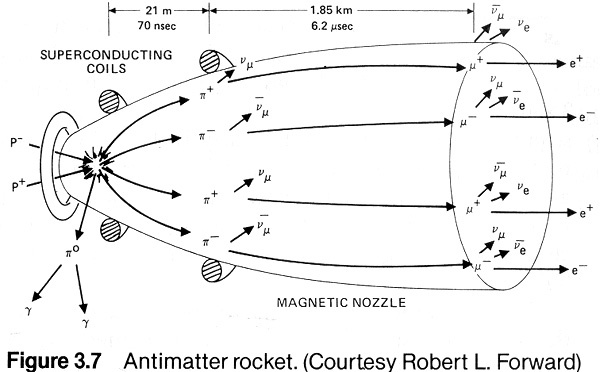 The (usable) antimatter reaction products are used as propellant, which boils down to just the charged pions. Those are channeled with a magnetic bottle. The advantage is that the specific impulse is huge. The disadvantage is very low thrust and copious amounts of deadly gamma rays. The nozzle is a huge slab of solid propellant shaped like a hemisphere. The fuel pellets are tiny antimatter containment vessels holding a charge of positrons. The containment unit has a lead shell. The pellet is shot to the focus of the hemisphere. The containment vessels is rigged to fail, allowing the positrons to undergo antimatter annihilation with electrons in the vessel. Because this is using only positrons and no antiprotons, the only reaction product is gamma rays. The lead shell converts the gamma rays into x-rays. The x-rays strike the propellant shell, vaporizing a layer which then shoots out the rear, providing thrust. 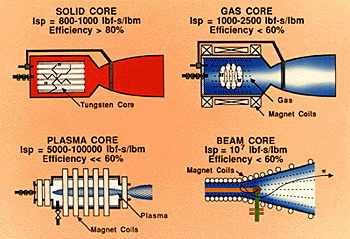 Specific impulse is between gas core and plasma core. Drawback include the low power density of positrons (1 antiproton = 1836 positrons) and the fact that 50% of the gamma rays do not hit the propellant slab. Antiproton-catalyzed microfission, inertial confinement fission. Very similar to Positron Ablative. Instead of fuel pellets containing positrons, the pellets contain uranium and deuterium clad in lead. When the pellet reaches the focus point it is hit by a beam of antiprotons and undergoes fission. The fission gamma rays are converted into x-rays by the lead in the same way s the Positron Ablative. Propellant is a hemispherical slab of silicon carbide. In front of the spacecraft is a large thin disc or "sail" about five meters in diameter. It is made of a graphite and carbon-carbon fiber, infused with tiny amounts of uranium. The spacecraft proper is attached to the sail by cables. On the spacecraft nose is an antiproton contaiment tank. it sprays a mist of antiprotons at the sail. The antiprotons cause the uranium atoms in the sail to undergo nuclear fission. The recoil pushes the sail, and the sail drags the spacecraft along with the cables. The two antimatter weapons I've run across are explosive antimatter warheads and particle beam weapons using antimatter. An antimatter particle beam will do some impressive damage to the target. But if the particles are moving faster than about 90% c, you will have about the same energy release if the partcles are matter or antimatter. At relativistic velocities antimatter particles are a waste of money and effort. Antimatter warheads have many problems.